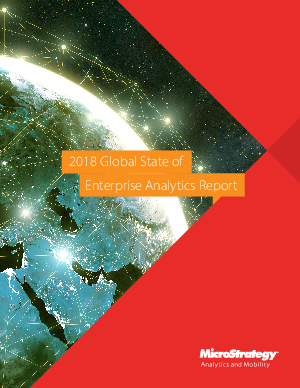 The MicroStrategy 2018 Global State of Enterprise Analytics Report, which surveyed 500 decision-makers from around the globe, reveals that leading organizations create a competitive edge through their use of data, with 63% experiencing improved efficiency and productivity, 57% realizing faster, more effective decision making, and 51% achieving better financial performance. Other top benefits include improved customer experiences, improved customer acquisition and retention, and the identification and creation of new revenue streams—all keys to digital transformation. What else did the 2018 report reveal? Read all the insights with both global and geo-specific views here.